After one of the greatest ultra races we have seen in a long time, Salomon’s Kilian Jornet has taken out his third The North Face UTMB race around the Mont Blanc Massive. Leading up to the race there was uncertainty around the impending inclement weather and with hours before the off, the race start was pushed back by several hours to ensure safe passage for the front runners over some of the higher passes. Even as the race unfolded the course changed again as the CP at Bovigny was destroyed by a storm and so they rerouted the course through Martigny. In total the course was still 170 kilometres long and with over 9300 meters of vertical to keep them honest. 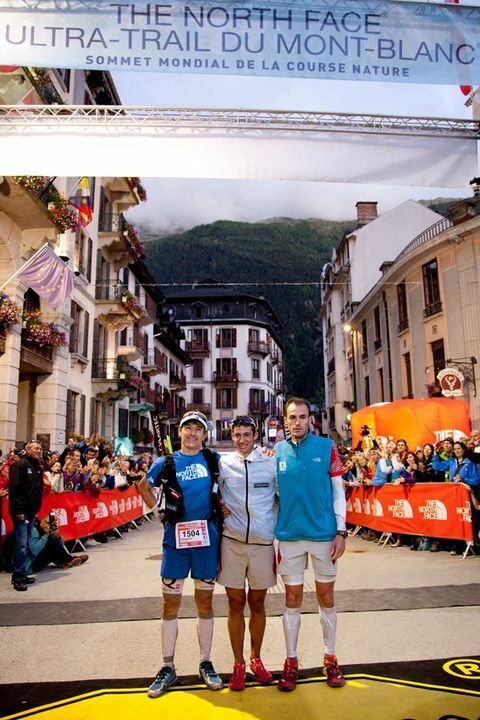 The TNF UTMB passes through three countries from France into Italy, Switzerland before returning to Chamonix in France. A race made famous by the sheer beauty of the course, the massive inclines and the huge number of runners who get to experience a great ultra mountain run. With over 2000 starters this year, the field was stacked with some of the worlds best athletes from both sides of the Atlantic and a fair sprinkling of top Asian athletes. Roes, Clarke, Koerner, Jurek, Jornet, Chaigneau, Heras, Braggs, Gaylord, Powell, Kabruki, Karrera, and in the womens race, Lizzy Hawker all lining up to take out the unofficial world championship of ultra running. A number of questions were being asked in the lead up to this weekends race was whether the International Trail Team from Salomon could keep their winning streak going. The Americans wanted some payback for all the hurt they had felt on their home territory with runs such as WS100 and Hardrock all going to European Salomon runners. Well, it didn’t take long to find out that Salomon were here t race as the likes of Heras, Kilian, Karrera and Francois D’Hane organised themselves into the trail running equivalent of a peloton, working well together on the climbs and pushing each other on the descents. The only athletes looking to rewrite the script was the North Face athlete Sebastian Chaigneau from France keeping them in check and at times taking the lead. At the same time the American superstars were either dropping off the pace or even dropping, and for the second time Geoff Roes failed to complete a 100 miler. Whilst this may sound like they are not up to the fight and the Europeans have pulled away in terms of talent and ability, it must be noted that this years UTMB has one of the highest drop out rates to date brought about by the fast lead out pace and the inclement conditions. As the race got down to the pointy end, it became clear that the winner would come from a group of athletes who had done a lot of the whorl at the beginning, namely Kilian, Heras, Carrera and Chaigneau as the likes of D’Hane were dropped on the final climbs with a troubling achilles. With less than 10 kms to go Kilian pulled away on one of the numerous climbs he knows so well to bring home the title for the third time in a pretty respectable 20 hours 36 minutes and 43 seconds. In the womens race the unstoppable Lizzy Hawker from the UK again repeated her previous performances by not only winning but also being inside the overall top 13. Nerea Martinez from Spain and another Team Salomon member is the only other female finisher as we write. In 2012 Team Ultra168 hope to be there competing en masse as long as the lottery is kind to us!